(Accidentally) Cross-Processed Slide | What? Why Bother? I’m new to medium format cameras (but I’ve already got 4 of them!) so I don’t get everything right. My first roll, shot with a Lubitel 166B, came out looking horrible, as if I’d deliberately overexposed it. The 2nd, shot on a Diana F+ was beyond terrible, only 2 shots came out ok, the rest it looked like fungus the Bogeyman had been sick on them (light leak problems were the least of it). Yesterday I got the rolls back from my Baby Bessa and my Zeiss Ikon Nettar 517/16. I shot B&W for the Baby. I shot what I thought was normal colour film with the Zeiss. I was slightly surprised/mortified to get an email form the lab asking me if i was sure I wanted this slide film processed in normal chemicals. I checked the box of films again – sure enough, it was slide film. Since slide processing is an extra £1.50 and I am nothing if not a cheapskate, I said ‘sure what the hell – cross process it!’ (or words to that effect). Cross-processed film (sometimes called x-pro) is notorious/celebrated for the unusual and sometime bizarre things that happen to the colours. 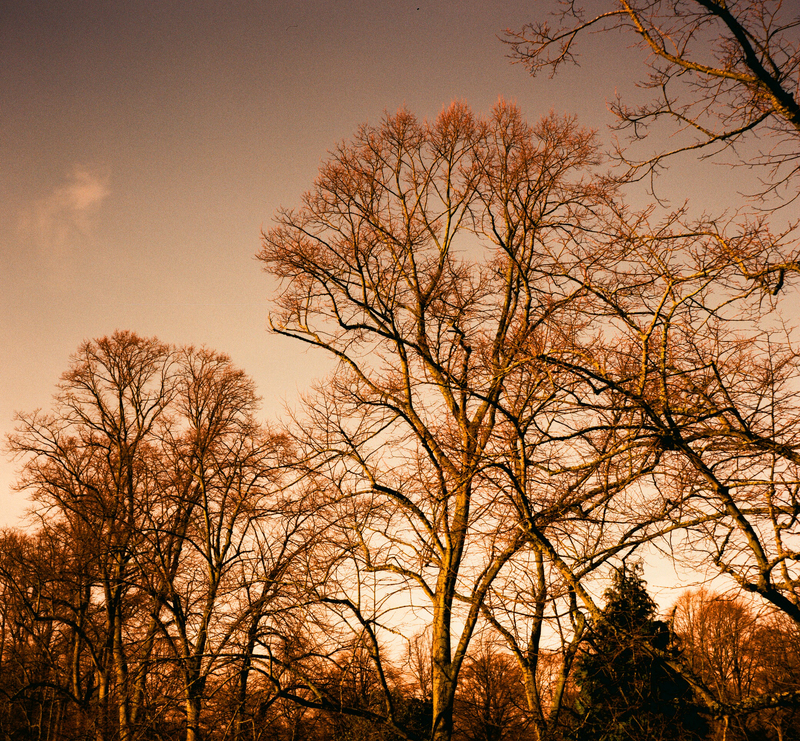 These pink trees are not only cross-processed, it is also a double-exposure. This is very easy to do with these old cameras without meaning to. This photo of some trees (I get impatient shooting test-rolls and tend to snap just anything) is a bit more normal, but still obviously different, like this bridge. I think I’ll be doing some more X-pro films, soon. This entry was posted in bad habits, Photography and tagged . 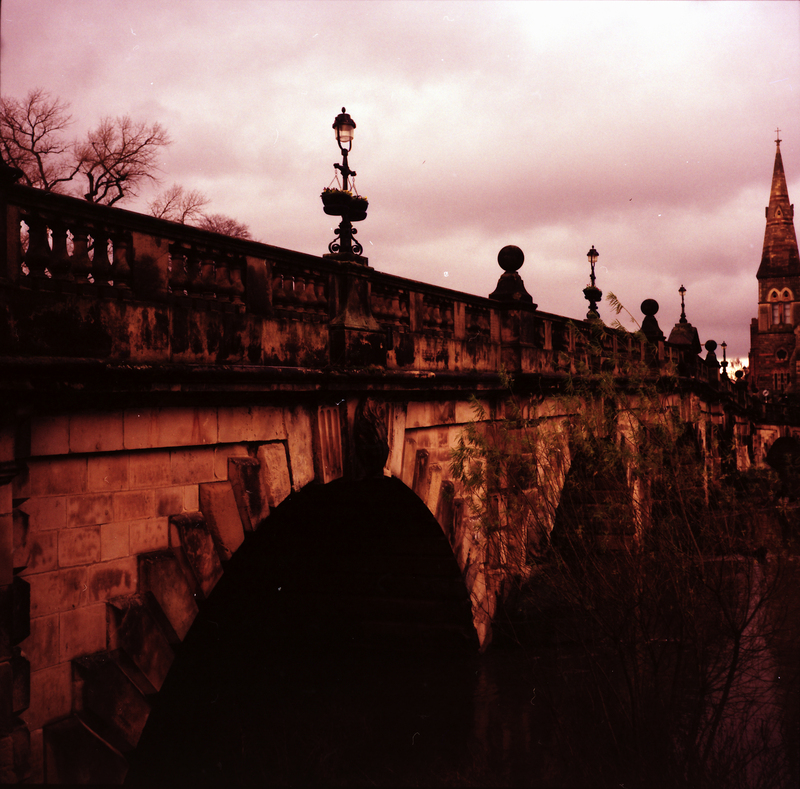 Nettar, 120, bessa, bridge, cheapskate, film, film-lives, Ikon, Lubitel, medium format, Severn, shrewsbury, tree, trees, x-pro, zeiss.